The park is suitated on nine acres of land with beautifully landscaped gardens, with access to the beach from the back of the park only minutes away. Large Undercover BBQ area ideal for those balmy summer nights or a winter retreat. Crystal clear salt water pool with kiddies pool attached, perfect for hot days shaded by big palm trees also with tables and umbrellas. Children's play area where lots of fun can be had by all. Laundry, with washing machines and dryers. Duck pond and viewing area on your way to the beach. Redhead Beach is at the northern end of a nine mile stretch of coastline, and is known for its stunning cliffs, rocky outcrops and shark tower. Redhead Beach is only patrolled in the warmer months and is popular with swimmers and surfers alike. Conditions are perfect for surfing, swimming and fishing and you can view the natural landscape by walking on a boardwalk to the beach to see swans, ducks and wildlife, which links up directly with Redhead Beach Holiday Park. Blacksmiths Beach is at the southern end of a nine mile stretch of coastline, which runs from Redhead down to the Swansea Channel. A popular family beach, which is patrolled in the warmer months, Blacksmiths Beach has an active surf lifesaving club, with surfing and swimming popular activities. Caves Beach is well-known for its namesake - a network of sea caves at the southern end of the beach, which can be explored at low tide. The beach runs for just 300m to the north to Swansea (Hams) Beach. With well maintained BBQ facilities and picnic areas, Caves Beach is a great family day out. Fernleigh Track is one of the region’s popular shared pathways, which runs along an old railway track from Whitebridge to Adamstown. 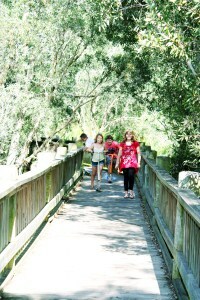 The track provides a peaceful and scenic walking and cycling track, through beautiful bushland. The track features a 180 metre long former rail tunnel. Information: When complete will extend through Redhead to Belmont adding another 9.5km to the track. Starting from the car park near the Fernleigh Track descend down a wooden ramp into the forest. Cross Flaggy Creek over a wooden bridge. 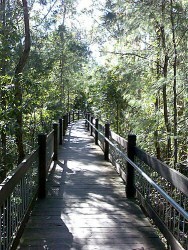 Track climbs gently through forest to emerge at Leichardt Lookout on the cliff top. Track continues to Glenrock Lagoon & Legge Beach. An area of coastal heath land between Dudley & Redhead. The tracks in the reserve are adventurous with some leading to Redhead Lagoon. A great spot for whale watching, bird watching and wildflower photography. These are just to name a few. Please visit Lake Macquarie Visitor Information Centre for more information. Whether you enjoy fishing from a foreshore jetty, a boat, or a rocky shelf along the coast, the diverse waterways of Lake Macquarie offer a spectacular aquatic environment that is home to over 280 species of fish. Flathead, Bream, Tailor and Whiting are the most common; other species appear seasonally including Jewfish, Snapper, Kingfish, Quid, Prawns and Blue Swimmer Crabs. Before you can start fishing in the lake or off the coast, a license is required. Prices begin at $6.00 for 3 days. Visit www.dpi.nsw.gov.au/fisheries/recreational or call 1300 369 365 for an agent near you. Swansea Channel - Various access points in Swansea and Blacksmiths. Pelican Foreshore - Pelican, off Lakeview Parade. This is a great spot fo the kids. Lucys Wall - Swansea Heads, end of Lambton Parade. This is a great spot for the kids. Well ladies whilst the men are fishing it's time to head to the markets for a little shopping. The 3rd Saturday of every month except December.